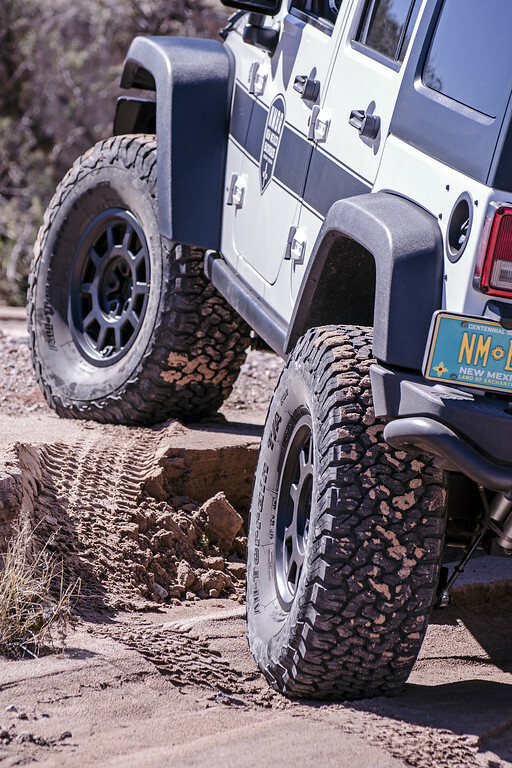 In March, New Mexico Backroads [NMBR] began the 2015 guide season with a new set of BFGoodrich 37x12.50R17 KO2 tires mounted on the NMBR Rubicon for a yearlong review. 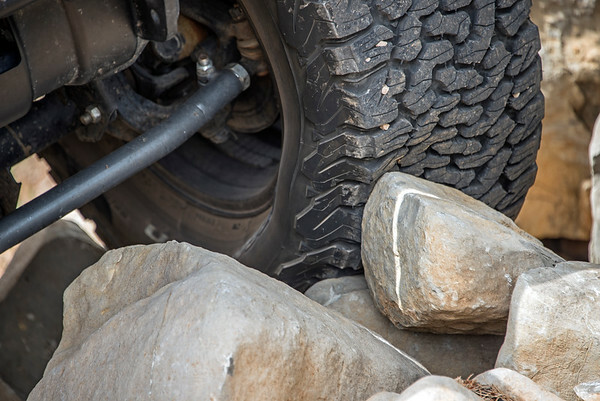 “Is it time to come back to an all-terrain tire?”—this question would serve as the running theme for New Mexico Backroads’ ongoing review and feature of the KO2. Would an overlanding based professional or enthusiast be willing to give up their big block mud-terrains for BFGoodrich’s next generation aggressive all-terrain tire? As of November 2015, the KO2 tires have over 15,000 miles of use, the majority of which has been off pavement and on dirt at 14PSI. NMBR’s 2015 adventures have included an expedition hosted for American Expedition Vehicles, two Ghost Divide Expeditions, traversing the historic Butterfield Trail with Overland Journal, the Gila Legends Expedition, the Camino del Tesoro Overland and a host of other rugged field work across the backcountry of the Southwest. The tires have been subject to every possible surface condition with the exception of ice. As mentioned in the (May) 2,000 mile KO2 review, the tires provide exceptional traction in a variety of challenging conditions and terrain while still maintaining excellent pavement manners. These strong characteristics have remained unchanged over the past eight months and 15,000 miles. Tire Review Background: Coming from my excellent experience (zero failures) with a half dozen sets of BFGoodrich KM2 Mud Terrain tires since their 2008 release, the KO2’s had some big shoes to fill. My early expectations for the new KO2 All-Terrain tires were that they would be a better all-around tire, but could possibly fall short of the KM2 in the most challenging situations or terrain. So far, my early assumption has been proven wrong—read on. Sidewall Durability: In technical off-pavement driving situations where the tire tread is not in full contact with the terra firma, and using the sidewalls for traction is necessary, the BFGoodrich KO2’s sidewalls hold strong. The KO2’s sidewalls feature sipes, a serrated shoulder pattern and an aggressive side lug design that provides ample bite when steering precision is critical. 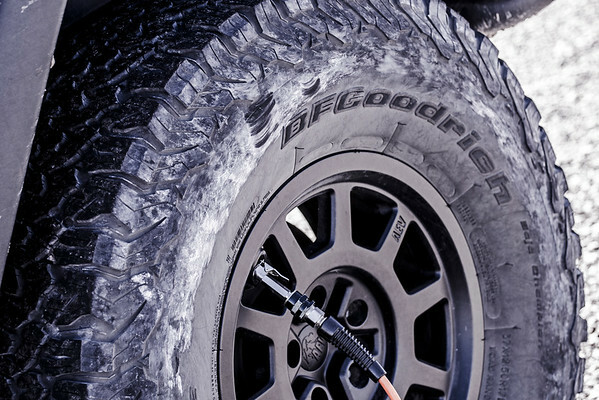 The sidewall material has been improved over the previous KO tire with BFGoodrich’s new Coregard Technology which provides a more durable rubber composition that resists bruising and cutting. For added protection, the durable sidewall rubber compound and side lugs of the KO2 extend farther towards the center of the tire. 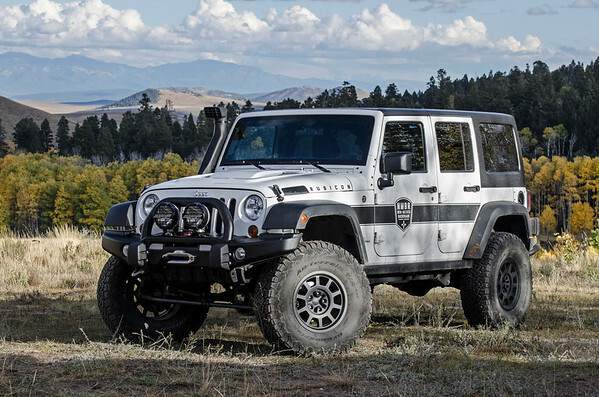 Hundreds of miles of both dry and flowing riverbed roads have been traversed by the NMBR Rubicon with the KO2. Hundreds, if not thousands, of rocks (football to VW Bug in size) have manhandled the sidewalls. When airing up, I always inspect the vehicle’s underside and tires for damage. Despite the heavy rock rubbings that lead all the way to the wheels; the sidewalls show no sign of cuts or gouges. Some of the harshest sidewall contact has come from fallen ponderosa snags in burn scar areas, where baked branches extend onto the trail like spearheads. While driving over such hazards on purpose is not advised, the splintered timbers have not compromised the KO2’s sidewalls. It was noted in the May 2,000-mile review that the KO2 sidewalls were stiff and the preferable off-pavement PSI was 12.5 PSI. In the months since, the sidewalls have broken in a bit, providing greater flexibility and a more pronounced sidewall “bulge” at low PSI. At 15,000 miles, 14 PSI now provides optimal (overall) off pavement stability and tractionfor NMBR Rubicon. Traction, Tread & Mileage: It is official, the BFGoodrich KO2 has equal or better overall traction characteristics as the BFGoodrich KM2. While the majority of the mileage I log is off-pavement, 4WD is only engaged when necessary. Many of the routes NMBR covers are three or four hundred miles between fuel stops where fuel conservation is critical. With the KO2 tires, I’ve been able to travel more miles in 2WD than with the previous KM2 tires. Whereas with the KM2 tires I used to arrive in Reserve, NM for refuel on fumes, after three days traveling along the Gila Legends Expedition route, I’m now arriving on a bit less than a quarter tank with the KO2 tires. The increased mileage could be attributed to enhanced traction and reduced 4WD engagement and the tighter (lower rolling resistance) tread pattern of the KO2—when comparing to the KM2. Either way, I’ll take it! Traction while climbing loose steep inclines is on par with the KM2. Spin out and breakaways are minimal when the differentials are both open in 4-low and non-existent when the differentials are both locked on the loosest and most angled terrain. 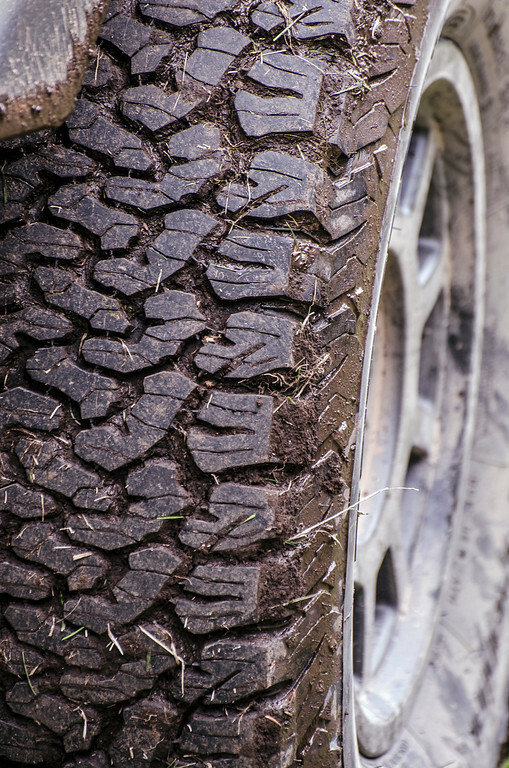 The quality of traction the KO2 tires provide in these difficult conditions rival that of the knobbiest mud terrains on the market—a big statement for an all-terrain tire. The extensive siping found throughout the KO2’s iconic interlocking tread block pattern provide enhanced traction beyond the aggressive treads themselves. While the tread edges remain sharp and unphased after 15,000 miles of hard use, the sipes edges themselves display slight rounding—this indicates that the sipes are working hard and essential to the tread pattern’s performance. Between the treads are small pyramid shaped risers that promote the ejection of stones and debris to optimize traction by keeping the tread gaps open and prevent drilling (or embedded stone caused tire damage). Pavement Manners: The BFGoodrich KO2 remains predictable and stable. Cornering is excellent for a 37-inch tall tire. Since the May 2,000-mile review, the preferred street air pressure has come down to 28 PSI. This puts all but a quarter inch of the tread in contact with the pavement while providing a decent ride on New Mexico’s pothole riddled byways. While the tires were fairly quiet rolling down smooth highway when brand new, they produce slightly more noise with 15,000 miles of use—not really a concern or complaint, just an observation. The KO2’s are still quieter than a new set of KM2’s. Balancing has been undramatic; no tire cause wandering, negative feedback or vibrations can be detected. 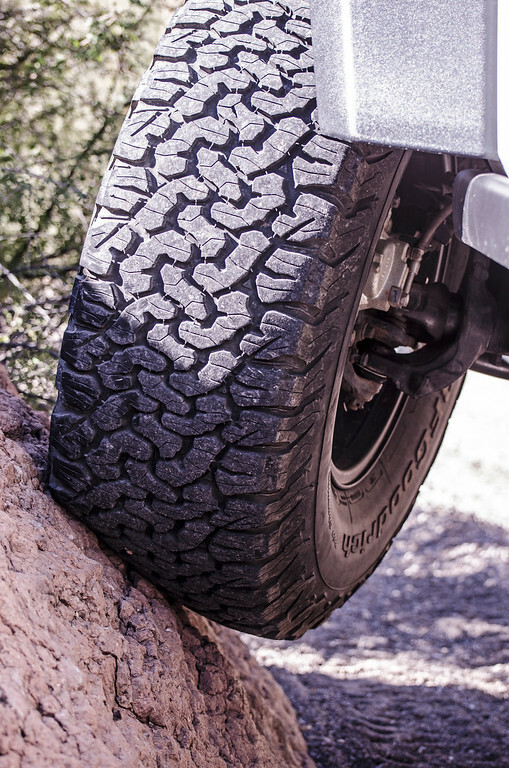 Tire Wear Characteristics: While keeping the basic overall interlocking tread block appearance of the previous KO all-terrain tire, BFGoodrich has heavily modified the tread rubber compound of the KO2 to provide a 100% longer on dirt tread life expectancy with the new KO2—a figure derived from extensive Baja development and third party testing. Given the hard life the NMBR Rubicon’s BFGoodrich KO2 tires have lived in a relatively short period if tune, the treads are in good condition. The tread depth of the tires new was 15/32 of an inch, at over 15,000 miles; they now measure an impressive 12/32 of an inch. It should be noted that the spare is still unused and will not be included in the regular 3,500-mile rotation and balance schedule. The NMBR Rubicon’s frontend alignment schedule has been every 5,000 miles. As far as trail related wear, only a half dozen nicks the size of a fingernail are present in the tread blocks—no chunking, splitting or cutting is evident. The tread block edges are still sharp and unphased. The siping within the tread blocks display minimal rounding—evidence the sipes are hard at work providing maximum traction. The wear exhibited so far would be the best I’ve seen of an aggressive all-terrain tire. The 15,000 mile KO2 review photos (displayed here) provide the best feedback on wear—the images say it all. The NMBR Rubicon’s KO2 tires are not even halfway through their service life. Rough Roads Ahead: As the fall sets in on the Southwest and temperatures cool, NMBR will be heading into the desert and hitting the rock strewn trails of Southern New Mexico. 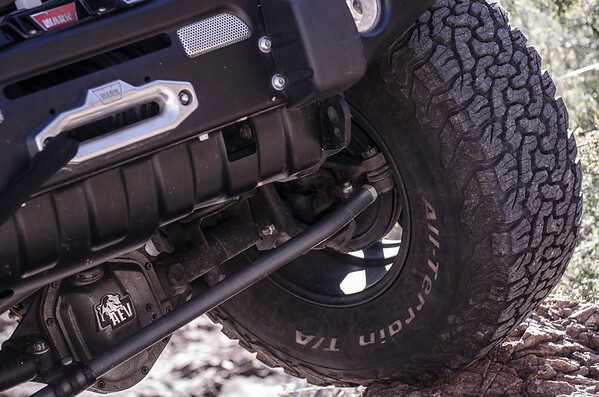 Will the KO2’s hold their own as the underdog all terrain or will the KM2’s be going back on? Stay tuned for the next installment of NMBR’s yearlong test and review of the BFGoodrich KO2.